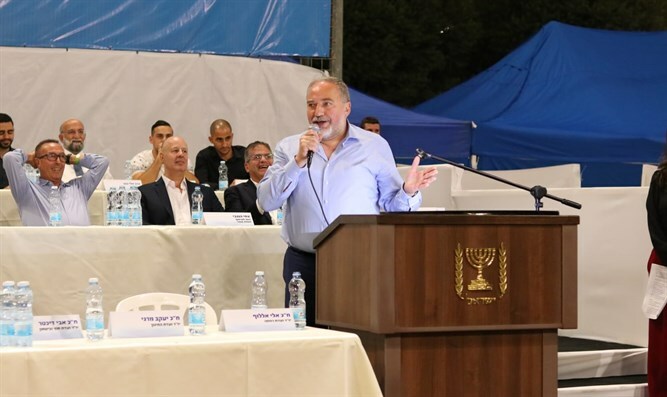 Defense Minister Avigdor Liberman spoke today at an election rally in Netivot about the situation in Gaza and the Gaza vicinity. "Some commentators tend to adopt an erroneous conception according to which one can want and can give, and I want to remind an important, wise man who once said, 'They give - they'll get; they don't give - they won't get.'" Liberman hinted at what Prime Minister Netanyahu had said in the past. "If there's quiet, if there's calm, we know how to be neighbors. You don't give quiet and calm, you'll get what you deserve," added the Defense Minister. Prime Minister Netanyahu, who also took part in the event, also addressed the situation in Gaza and said, "We have an issue with a junta that's taken over 2 million people. They were 3,000 before the unfortunate, mistaken, and tragic disengagement, and today they're 65,000 armed people." The Prime Minister added, "They're committed to our annihilation and therefore they're not partners in the political sense, but they understand very well our other messages."